After hours of working the phones at Rauner HQ, we're ready for this. It is officially Election Day in most parts of the country, and I thought it would be fitting to share my thoughts on the gubernatorial race on the state I’m in, and whose victory party I’m looking forward to being at (fingers crossed that it will actually be a victory party) later this evening. The Gate, which is UChicago’s political publication just published what the College Republicans wrote on the race (not surprisingly, we back Rauner, as do many Democrats), and I figured that since I wrote enough of it I can post it here as well. This is where I will say thanks to Jake Mansoor and Steven Yaffe for ensuring that we covered everything in the piece, and The Gate staff for editing it (meaning this will be one of the best-written posts on this blog). It is no secret that all eyes will be on Illinois this election cycle, and with good reason. Whether you have been a lifelong resident of Illinois, or are only planning to stay for your four years at the College, this election is going to have a direct impact on you, and you should vote with that in mind. The youth unemployment rate for recent college graduates in Illinois is an astonishingly high 18.5%, more than double the national average. It is unacceptable that this is the best a great state like Illinois can do. 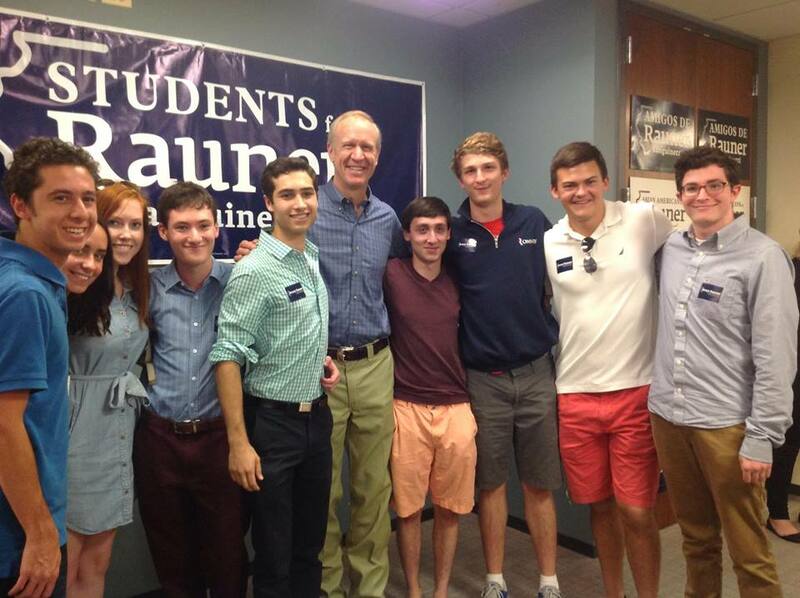 We always talk about how we at UChicago have a responsibility to give back to our community, and as a proud pro-choice, fiscal conservative, Bruce Rauner truly embodies this principle. Bruce Rauner and his wife Diana, a Democrat who runs a non-profit providing low-income children with early childhood education, have made education their lifelong passion. Bruce’s philanthropic work in improving Chicago public schools and his investment firm’s success in providing great pension investment returns for Illinois teachers and other public employees demonstrate how Rauner has always felt a moral obligation to help his fellow Illinoisans. For the current Quinn administration, education simply has not been a priority. The governor has cut education funding by $500 million, and Illinois ranks forty-fifth in America when it comes to college affordability. Bruce believes that every child should have a fair shot at a good education, regardless of the zipcode they are born in. Quinn, who himself attended an elite private school in Oak Park, opposes school choice, confining underprivileged kids to underperforming schools simply because of where they live. Bruce has spent over twenty years working on improving education in both charter and public schools to great success, so he speaks from the heart when he talks about the need to reprioritize education funding in our budget. When it comes to exercising strong leadership, Quinn dithered while Bruce fought for an issue that is important to all college students: Uber. When the Democratic legislature passed a bill that would have gutted Uber in Illinois, Rauner was at the forefront of the opposition, calling on Quinn to veto the bill. Although Quinn ultimately opposed the bill, his opposition came from the fact that Rauner would have made it a campaign issue. His indecision, in which he waited until the very last day to act, stands in stark contrast to Bruce’s firm and consistent support for innovation. Ultimately, this election comes down to the direction of Illinois’s future. If you’re satisfied with thirteen credit downgrades, an “F” for small business friendliness, the second-highest outmigration in the nation at a rate of one person leaving every ten minutes (a recent Gallup poll found 50% of all Illinoisans would leave the state if they could), and a governor under two federal investigations, then Pat Quinn is your candidate. Quinn is, after all, the only candidate in the race who vouched for the impeccable integrity of his predecessor and former boss, Rod Blagojevich(who is currently sitting in a jail cell for trying to sell Obama’s former Senate seat). Rauner is serious about changing the business of politics in Illinois—and it is evident by the fact that he has picked up endorsements from all of the major statewide newspapers, including the Chicago Tribune and the Chicago Sun Times (which broke its own policy of no longer endorsing candidates because this race “is simply too important”). If you want to bring back Illinois, reform our antiquated tax system, repair education, and enact term limits, then Bruce Rauner is your candidate. Rauner has also picked up endorsements from across the political spectrum, including from community members such as the former head of Latinos for Obama Manny Sanchez, prominent environmental activist Wendy Abrams, former state senator Reverend James Meeks, and James Crown, the president of Henry Crown and Company and member of the UChicago Board of Trustees (yes, THE Henry Crown), as well as many others who are putting meaningful reform before party politics. For Illinois, this election is not about partisanship; it is about what is best for the people of the state, and for those reasons, we are supporting Bruce Rauner. This Sunday, remember to change your clocks. On Tuesday, remember to change your governor. To see the original post, look no further than right here. After hours of working the phones at Rauner HQ, we’re ready for this.